What's My Movie Poster Worth? 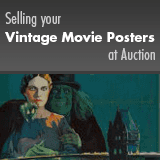 Our experts will evaluate your Movie Posters for auction or private treaty sale. How do I Authenticate My Posters? When seeking out the value of a poster, it is important first of all to determine its actual authenticity and whether the release date makes it an original or re-release item. Paper size, texture and copyright info usually determine age of most film posters. Many of the earlier vintage posters produced before 1940 had studio logos and copyrights but were often not dated. After 1940, National Screen Service distributed most U.S. film posters and these were dated and coded at the bottom of the poster. In the 1960's and 1970's several companies, the most prominent being Portal Publications, reproduced a number of vintage movie posters. Several aspects of these posters make it easy to identify them as reproductions. First, their size — 24" x 36" — a size not produced by any movie studio for display in theaters. The standard "one sheet" size movie poster was always 27" x 41". Second, at the bottom of the poster was clearly printed "copyright Portal Publications". It had the original release date of the film, but it still is not an original. These posters were printed on a flat stock, which does make them appear in this day and age — "old", but they are not original and are virtually worthless. Re-release or reissue posters are still "original" theater used movie posters, but have considerably lesser value than a first release poster. Most often you can determine a reissue by looking at the bottom of your poster in the right hand corner. There will usually be an "R" in front of a year number — as in "R56" — if it is a reissue. Other clues are phrases such as "An Encore Hit", "Brought Back by Popular Demand" or "Nothing Cut But the Prices". Newer posters from the 1990's on, produced on glossy stock, have been "bootlegged" in the thousands, so it is very difficult to determine authenticity. What makes a Poster Valuable? For movie posters, value is determined by a combination of factors, the most important being the title of the film. The most desirable posters are those from the most universally loved films such as Wizard of Oz, Casablanca, or It's a Wonderful Life. The second deciding factor in desirability is the graphics on the poster. Often the title to a film poster might not be of importance but the graphics can be gorgeous. The poster might be illustrated with beautiful art-deco graphics or depending on the artist, of which many well-known illustrators of the first half of the twentieth century worked on posters, it could make the poster valuable. Finally the Condition is of great importance. These three factors are usually the most important in determining value. Vintage material from the early 1910's through the 1950's usually commands the highest prices. Some posters from the 1960's also bring good prices, but the value of titles from the 1970's up to the present drop dramatically due to the increase in the print runs. Up to the 1960's a normal poster print run would range from 3,000 to 5,000 per poster, in the 1970's up to present day, the print runs went up to 15,000 to 30,000 for a poster title. Another major factor is that poster collecting only really took off in the 1970's. From the early days through the 1960's most posters were simply thrown away after the run of the film. The top horror and science fiction film titles have always generated the highest prices and continue to do so. Other genres and stars that receive high value include Film Noir, the Marx Brothers, Marilyn Monroe, James Dean, Douglas Fairbanks, early Walt Disney cartoons and other classic animation, and Alfred Hitchcock. How Can I Determine Value of My Poster? As with any collectible, prices for movie posters fluctuate wildly. There is currently no up to date printed price guide for movie posters. We recommend using Heritage's Permanent Auction Archives of over 100,000 items to give you a good idea of current value. If your title is by chance not listed there, searching for prices by star or genre should give you a comparable estimate. If you think that your poster has value using the guidelines given above, please contact us. Should you wish to sell or auction your collection with us here at Heritage, our movie poster experts can give you a fair estimate of the value of your items. We are always looking for quality movie posters and would be happy to discuss it with you. Grey Smith began as Heritage’s first Poster Expert in 2001 and has been director of the category for almost 20 years. He received his degree from the University of Texas in Austin with a BS in Film Communications, after which he pursued a career in the motion picture industry. He began collecting vintage movie posters as a child and during his 22 year career in the film industry, he traveled the globe, always searching for, collecting and selling movie posters and studying the market. He now heads the world’s #1 Vintage Poster Auction venue.